NEW YORK (Bloomberg) -- General Motors Co. and Chrysler LLC will lead automakers to “gushing profits” when annual U.S. sales reach 15 million vehicles, said Steven Rattner, the former head of the federal government's auto task force. The auto industry is recovering a bit slower than expected and eventually will return to a pace of 15 million a year, Rattner said. U.S. automakers in September sold vehicles at a rate of 11.8 million, up from 9.4 million a year earlier, according to researcher Autodata Corp.
GM's unwanted businesses in bankruptcy, known as Old GM, today won conditional approval for the largest manufacturing reorganization in history, as a judge said the rights to a potential $1.5 billion in lawsuit proceeds would be determined later. 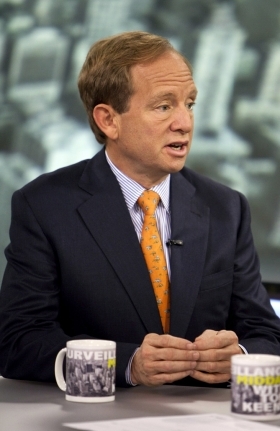 Rattner said today the slumping global economy will test U.S. companies and create a challenge for the auto industry. Rattner, co-founder of Quadrangle Group LLC and the subject of state and federal investigations of corruption at New York state's pension fund, is near a settlement with the U.S. Securities and Exchange Commission, according to a person familiar with the matter. Because of the pending settlement, the Detroit Economic Club canceled a speech Rattner was scheduled to deliver before the group in Detroit next week. Rattner, 58, arranged to retain Henry “Hank” Morris, the former chief political consultant to ex-New York Comptroller Alan Hevesi, as a placement agent and paid him more than $1 million in sham “finder” fees, according to the SEC and New York Attorney General Andrew Cuomo. Rattner also is accused of setting up a DVD distribution deal for a movie produced by the brother of a pension fund official. In exchange, Quadrangle, a New York-based private-equity firm, obtained $100 million in investment commitments from the New York state Common Retirement Fund, said Cuomo, who resolved a probe of the firm in April for $7 million.